Received 16 October 2009; revised 11 January 2010; accepted 15 January 2010.
the group PG-RY compared with the group PJ-T.
performed in 42.6% of the periampullary cancers . mone imbalance or abnormal gastric peristalsis . have not yet encountered fatal complications. with a median age of 66.0 ± 8.6 years (range 46-82 years). tive days or before discharge from the hospital. approximated and sutured to the proximal hepatic duct. tube is not placed beside this anastomosis. made between the remnant jejunum and the pylorus. Table 1. 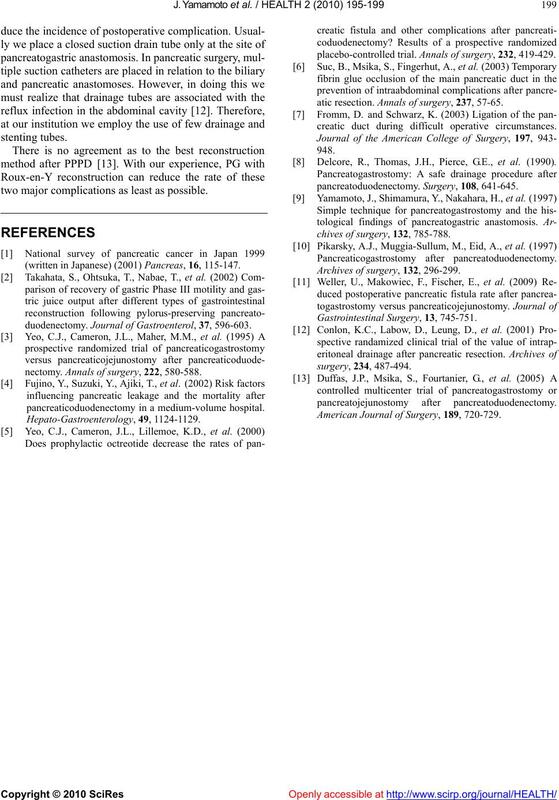 Clinical factors in patients who underwent pylorus-preserving pancreatoduodenectomy. * All the patients with obstructive jaundice underwent biliary drainage before the surgery. Figure 1. (a) Pancreatogastrostomy with Roux-en-Y reconstruction; (b) Pancreatojejunostomy with Traverso type reconstruction. en-Y anastomosis technique (Figure 1(b)). 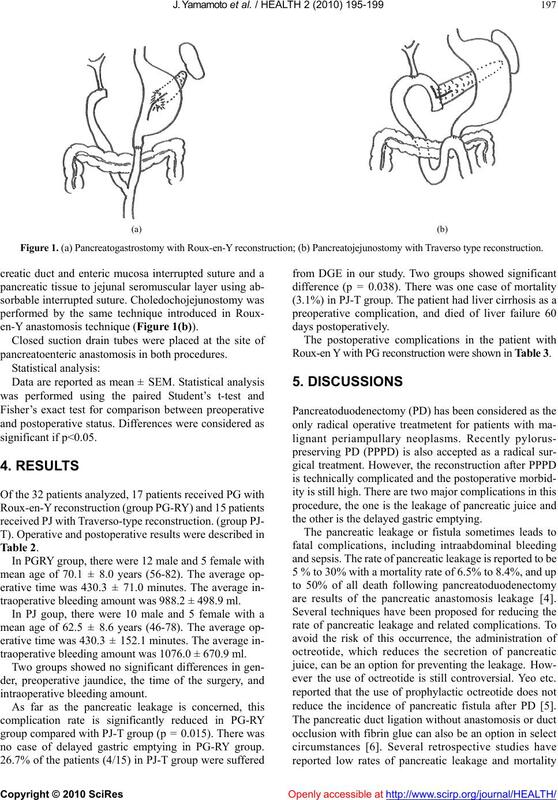 pancreatoenteric anastomosis in both procedures. traoperative bleeding amount was 988.2 ± 498.9 ml. traoperative bleeding amount was 1076.0 ± 670.9 ml. no case of delayed gastric emptying in PG-RY group. Roux-en Y with PG reconstruction were shown in Table 3.
the other is the delayed gastric emptying. are results of the pancreatic anastomosis leakage . ever the use of octreotide is still controversial. Yeo etc. reduce the incidence of pancreatic fistula after PD . Table 2. Operative and postoperative results. full thickness of gastric wall inside of the stomach . It is also important to avoid intraabdominal infection. two major complications as least as possible. (written in Japanese) (2001) Pancreas, 16, 115-147.
duodenectomy. Journal of Gastroenterol, 37, 596-603.
nectomy. 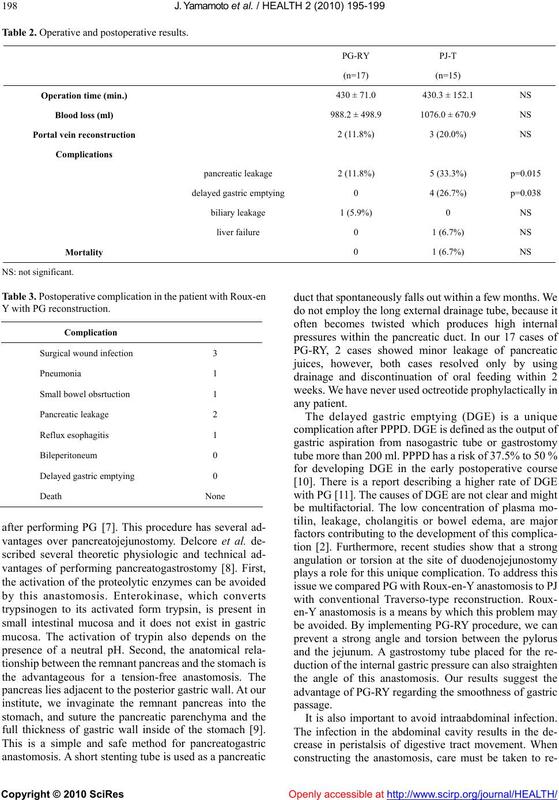 Annals of surgery, 222, 580-588.
pancreaticoduodenectomy in a medium-volume hospital. placebo-controlled trial. 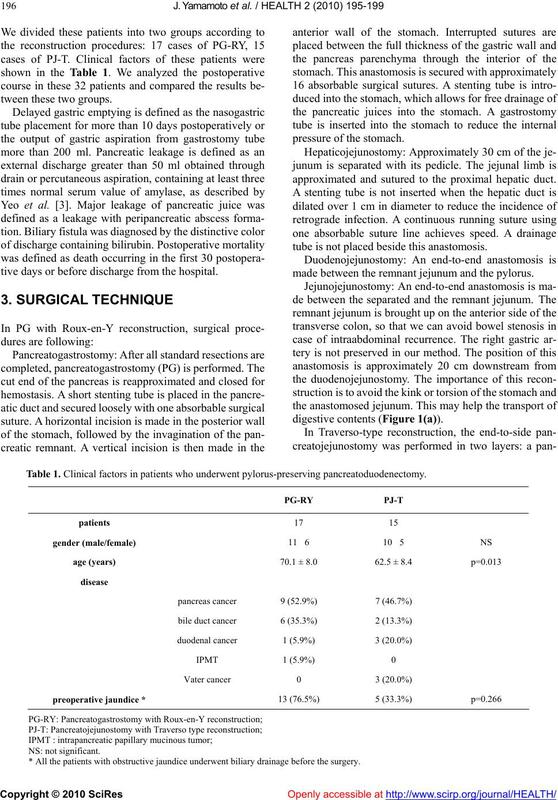 Annals of surgery, 232, 419-429.
atic resection. Annals of surgery, 237, 57-65.
creatic duct during difficult operative circumstances. Delcore, R., Thomas, J.H., Pierce, G.E., et al. (1990). chives of surgery, 132, 785-788. Archives of surgery, 132, 296-299. American Journal of Surgery, 189, 720-729.